You might have heard the whispers of it around Galway — in 2017, the City Centre is getting a massive (indoor!) hub for youth culture, design, and sport, with elements to make it family-friendly as well. The massive two-story space in Fairgreen House has sat vacant for years, but it’s getting a complete revamp thanks to the vision and hard work of John Deely from DC Store Galway. 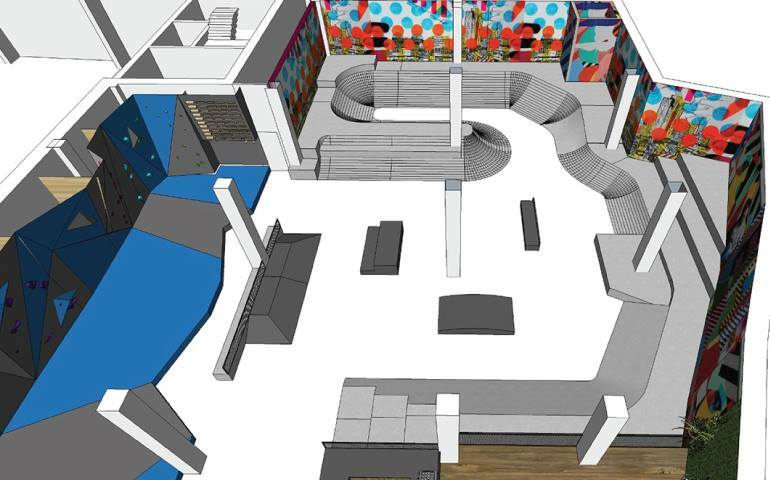 The VAULT will be open to everyone of all ages — it will feature a skatepark, climbing wall, urban library, cafe, as well as adaptable workspaces to hold workshops for design, yoga, cookery, art and more. 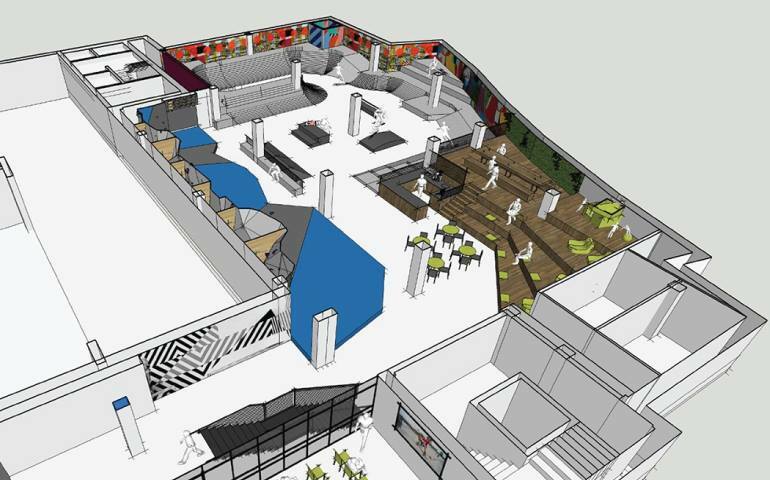 The entire family can come and enjoy the different aspects of the space, and it will give Galway’s youth a safe, urban space to explore different interests and get involved with a larger youth community that’s tuned into their interests. We sat down with John Deely to ask him where all this came from, and what it will look like when it’s finished. 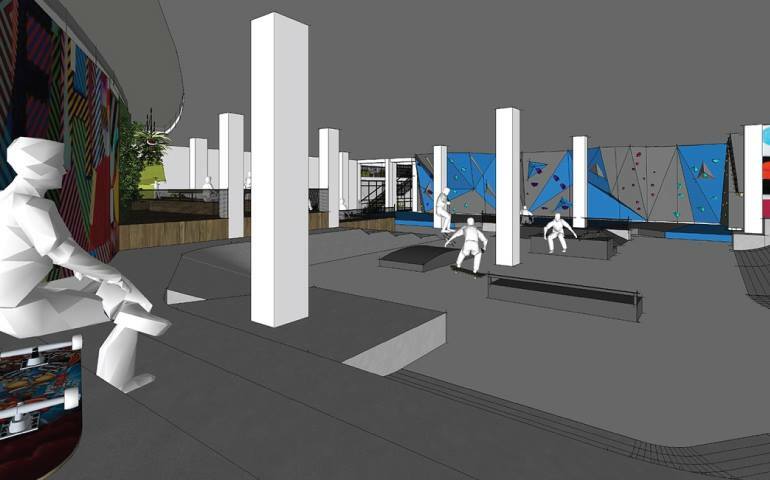 Pictured: A draft of the climbing wall and skate park, with street-art mural space. So where did the idea for the Vault come from? “It started with quite a simple idea… This father and son came back to Galway, they’d been in some really cool venues in the UK, and they said, ‘Galway really needs something like this.’ It always did. I’ve been aware of it for years. And then I became aware of this space [in Fairgreen House]… Nothing’s ever been done with it. Has there been many times when you’ve seen a real need for something like this in Galway? Numerous times, there’s been global skate teams in Ireland, and they’ve done the Belfast leg, or the Dublin leg, or Limerick — and then they have to pull the Galway leg at the last minute because of the weather. So the kids of Galway didn’t get to see their Tony Hawks, or whoever. So that’s happened a few times — and then [DC Store] even tried to organise skateboarding lessons a few times, but the only venue is out in Moycullen… It’s not as accessible. With the Vault, we’d have an easily accessible, indoor venue for that. Pictured: There’s room to sit back and watch, for friends or parents. So when you say the venue has to be multi-disciplinary, what does that mean? So not everyone’s going to be interested in skating, but they might be interested in the photography and videography of the skating, or the development of those photos, or the editing, or the graphic design that goes into the videos… You can see a lot of these kids get into editing the movies — it’s a subculture of urban arts. We also wanted to include a retail element — but we know from [experience with DC Store] that if it’s just streetwear, it’s too pigeon-holed, it’s too nice. So we’re aware of that. And then the other part is finding something that’s complimentary to that. I came across a model of something similar called Brooklyn Boulders in the States — it’s a co-working space with a climbing gym within it. The idea is that when you need a break from the desk you can take a climb, or head to the juice bar. It’s a cool model, and where we’re right in between Super Pixel Labs and the Portershed, we thought it could work. What do you envision the space looking like, when it’s completed? The goal is to eventually expand the Vault across Ireland, and to be very inclusive in that expansion. The Vault would engage rural communities with a high youth population, as well as potentially linking up with groups for people with disabilities to get them involved as well. 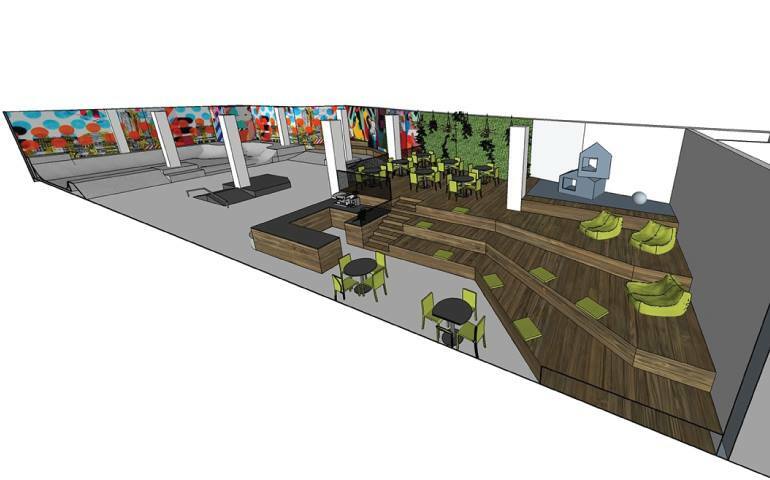 Pictured: The mezzanine lounge and cafe space, in conjunction with a soft-play area for young children. Fair play guys! This is the type of place the rest of Europe would envy. Hope everything goes well & maybe involve the Irish skate association if you guys need any help, they helped us with our local park in Dublin! This is a very good idea for Galway city centre. A safe place for younger and older youth to hang out is badly needed. Also a venue for Disability groups too would be a very welcome inclusive objective. Well done and good luck! The park looks sweet and the whole thing is going to satisfy a long time requirement/dream of many people. I just hope there is going to be a sign on the par, like one at the Milennium park: “Enter on your own risk”. Kids could be a huge issue as like in many park, the parents let them go in, run around and do whatever they want. Could be a safety issue. Not to us who rides, mostly for them. When will this be open and anything we can do to help? 15 year old daughter desperate to join something not much around city..